NETWORK UPDATE: THE BIG BANG THEORY gained 0.2 in final numbers, but LIFE IN PIECES dropped 0.1. After adjustment for the football preemption in NY, PENN & TELLER: FOOL US and the rerun WHOSE LINE IS IT ANYWAY were each down 0.1, and SIGNIFICANT MOTHER fell 0.2 to a horrific 0.1. CABLE HIGHLIGHTS: ESPN dominated the night, of course, with MONDAY NIGHT FOOTBALL, which at 4.65 was nevertheless much below last week’s 5.94/5.31 season openers. VH1’s LOVE & HIP-HOP HOLLYWOOD jumped 0.33 to 1.44, while BLACK INK CREW gained a tenth to 1.10. USA’s WWE telecast was at 1.18-1.10, very close to last week’s 1.18-1.06. On Bravo, REAL HOUSEWIVES OF ORANGE COUNTY was down 0.04 to 0.79, and LADIES OF LONDON climbed 0.08 to 0.41. 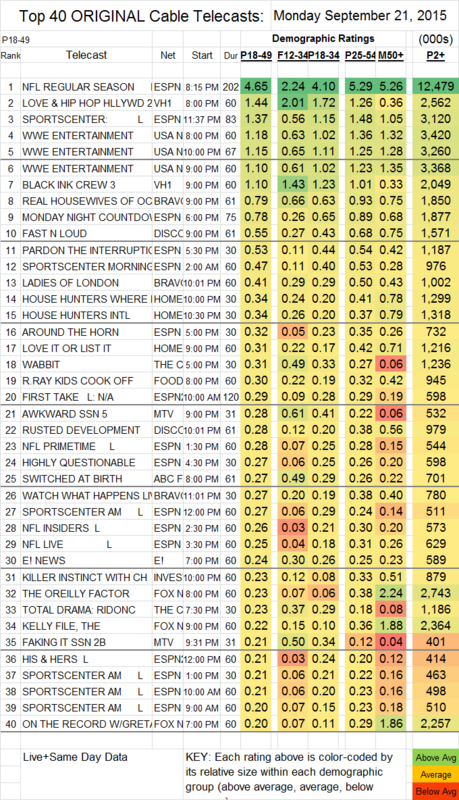 On Discovery, FAST N LOUD dropped 0.05 to 0.55, and RUSTED DEVELOPMENT fell 0.07 to 0.28. On MTV, AWKWARD lost 0.09 to 0.28 (and in the F12-34 demo, it was much worse, down 0.35 to 0.61), and FAKING IT was up 0.03 to 0.21 (but down 0.04 in the demo to 0.50), then the rejiggered remainder of the line-up had GIRL CODE LIVE at 0.14 in its new 10PM slot, TODRICK at 0.06/162K at 10:30PM, and GIRL CODE at 0.07/176K at 11PM. On ABCFamily, SWITCHED AT BIRTH collapsed by two-tenths to 0.27 in 18-49s, but held better in the F12-34 demo by losing 0.12 to 0.49, while CHASING LIFE fell 0.09 in 18-49s to 0.19, and was down 0.15 in F12-34s to 0.36. BIG BROTHER AFTER DARK (POP) was at 0.04/106K.